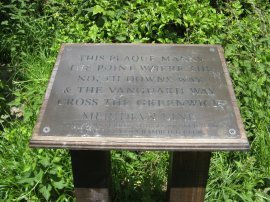 I did this walk on Sunday 15th June 2008. 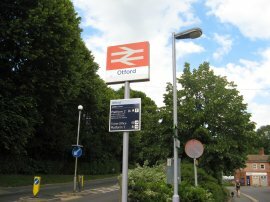 I drove down to Otford station where I met my friends Anne and Sara. 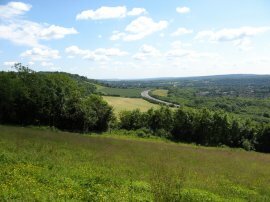 From there we then took one of the cars over to the Caterham Viewpoint to resume my walk along the North Downs Way. 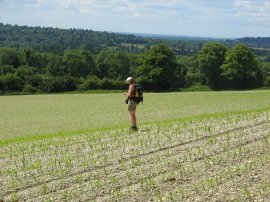 They had both walked the whole of the North Downs Way a year earlier and it was pleasant to have their company for this part of my walk. 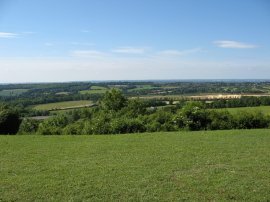 It was a bright sunny morning as we set off from the viewpoint and the air was very clear with good visibility over the surrounding countryside, photo 1. 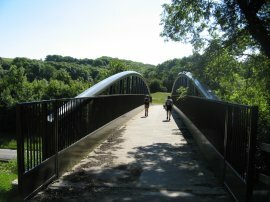 From the viewpoint the North Downs Way makes it way through trees, gradually descending to cross a footbridge over the A22, photo 2. The route turns to the right along a track, then heads to the left besides a small industrial estate before taking a footpath that runs along the side of Winders Hill. 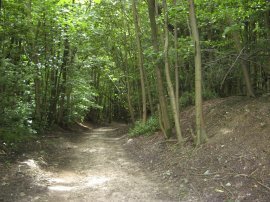 The path heads steadily uphill through trees, crossing a road and then taking a footpath that runs in the trees just above Tandridge Hill Lane. Ahead there were views along the M25 motorway into Kent, photo 3. A short distance further on by Gangers Hill the path turns to the right to descend steeply down a flight of wooden steps carved into the hillside. Halfway along the steps a small rest area with a bench had been constructed, photo 4. The route then heads along more open ground before dropping down almost to the valley floor to skirt a chalk pit which can be seen in the distance in photo 5. 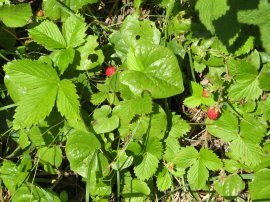 In a number of places I spotted some wild strawberry plants, their berries already bright red, photo 6. The route crosses a minor road and heads briefly uphill to join the route of the Vanguard Way for a short distance. 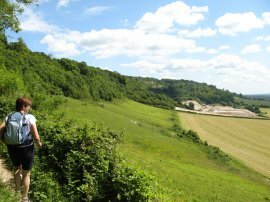 The North Downs Way makes its way along a chalky path that runs over the grassland at the foot of the downs before joining a path that runs along the edge of a field below the Titsey Plantation. 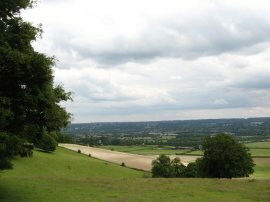 In the distance we could see the town of Oxted and also further afield, planes taking off from Gatwick Airport. Whilst crossing over these fields the North Downs Way also crosses the Greenwich Meridian Line. 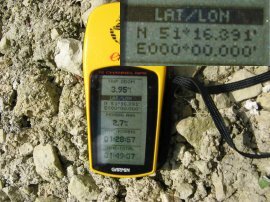 The site is marked by a small plaque, photo 8, although my GPS, photo 9, made the actual meridian about 15ft to the left. Having moved from West to East the path continues ahead alongside the field a short distance further before leaving the Vanguard Way and turning left to join a track, Pitchfork Lane, photo 10, that runs steeply up Titsey Hill to the top of the downs once again. At the top of the path turns to the right, once again taking a path that runs through trees alongside a road. Eventually the route bears to the left taking a footpath that crosses White Lane and heads gently uphill towards Clarkes lane farm where the route crosses a road and continues ahead along Chestnut Avenue, passing a house with a very attractive painting from the Wind in the Willows painted on its front wall. At the end of this road the route continues to the right along a broad unsurfaced track, heading slightly downhill below Betsom's Hill, the summit of which is the highest point in the County of Kent. 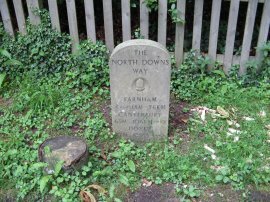 Somewhere on this stretch of path I past a concrete North Downs Way marker, photo 12, that showed I had now covered 48 miles from the start of the path at Farnham. At the end of the track the route crosses over the A233 into a field and where we stopped in the field to eat our lunch looking out at the slow moving traffic along the M25 in the valley below. From the field the North Downs Way heads uphill and turns to the right along a narrow path through a smaller patch of woodland before turning to the left for a steep, but short ascent to the top of the downs. 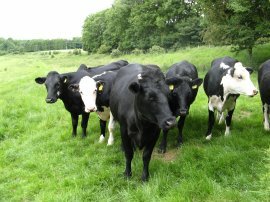 The path crosses a number of fields, one of which had a number of cows gathered around the exit stile, photo 13. 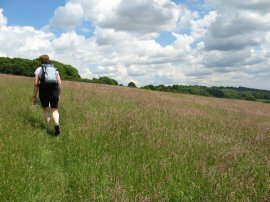 The route then follows the top of the hill for a couple of miles, passing through a number of fields and tracks. For a while the route runs parallel with Brasted Lane before continuing ahead and over a couple of more fields before turning to the left along a track near Knockholt where photo 14 was taken. The path then turns right and then left around a field edge before crossing a minor road, Sundridge Hill. Close to this point, just off the route of the North Downs Way a trig point was marked on the map, which Anne went off to find, hidden amongst a rather overgrown hedge and field border. 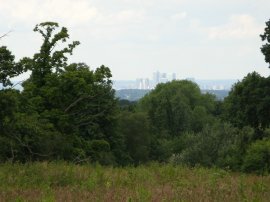 For a while the path was running along the northern edge of the downs, I think for the first time so far in the walk, and between the trees the tower blocks of Canary Wharf where clearly visible, photo 15, not that far in the distance. After crossing a few more fields the route gradually turns to a more Southerly direction and starts dropping back down the downs towards the M25 and Dunton Green. Ahead there was one of the longer road walking of the route so far, so before we commenced that part of the walk we sat down for a short but pleasant break on the grassy hillside over looking Sevenoaks and its surrounds, photo 16, listening to the sounds of the church bells of Chevening Church below us. 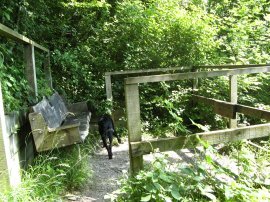 Anne had brought her dog Zuka with her who came and sat besides me, perhaps guessing I might be the best bet for some illicit crumbs of cereal bar. We then headed down over fields to join the rather busy B2111 road besides the M25. 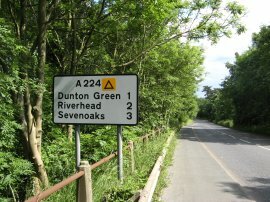 Reaching the A224 the route turns right, crossing over the motorway and heading down towards Dunton Green. 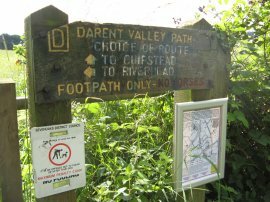 Reaching the Rose and Crown pub the North Downs Way turns left up the London Road and then right, just before the Donnington Manor Hotel along a track that heads gently uphill along the edge of a field, joining up with the Chipstead arm of the Darent Valley Path, photo 19. The route continues ahead over fields and joins a path over some railway lines. Once over the railway lines the route joins a track, Telston Lane, that leads into the village of Otford. 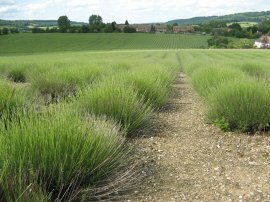 On the way passing a number of fields that had been planted with Lavender, photo 20, although it was about two weeks short of being in full bloom. Passing through Otford I noticed the pillar in photo 21. 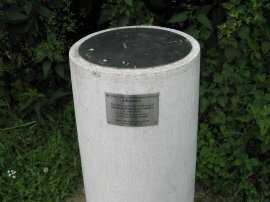 The plaque says that "This pillar is part of the Earth's largest solar system scale model (1:5 billion) showing the planet positions at 00:01 hours 1 Jan 2000. Sun is 649 meters away on the recreation ground". The pillar in the photo represented Uranus. 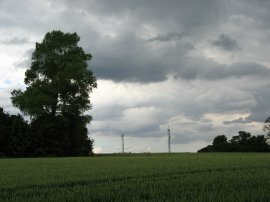 I never got to the sun but I did pass Neptune and another planet, Saturn I think, as I made my way through the village. At the end of Telston Lane the route turns right along Otford High Street. 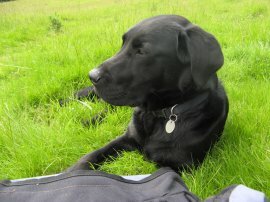 While we had been walking down Telston Lane we had been joined by another male Labrador who was showing a lot of interest in Zuka and continued to follow us for some distance down the main road in a rather haphazard manner, despite our best efforts to make him go away. Eventually he did turn round and headed off following another dog walker as we made our way through the village towards the station. 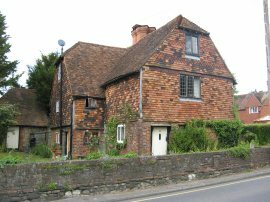 We crossed a bridge over the River Darent and continued on past a number of attractive old houses, photo 22. 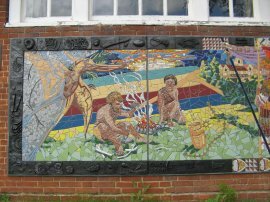 Photo 23 shows part of a mural by Oliver Budd detailing the life of the village from pre history up to present times starting with a pterodactyl at the dawn of time and finishing with a mother picking apples from a local fruit tree and handing them on to the next generation which adorns the side of one of the buildings. From there it was just a short distance uphill along the main road through the village, past the village pond with its large willow tree and on to Otford Station, photo 24, where we finished this stage of the North Downs Way. Reaching Otford Station we had walked 15.2 miles, all along the North Downs. I have to admit that I am quite happy walking on my own but it had really been nice to have the company of Anne and Sara on this walk and hopefully they will be able to join me on other parts of the walk to, I don't know, I seem to be getting much more sociable in my old age!.